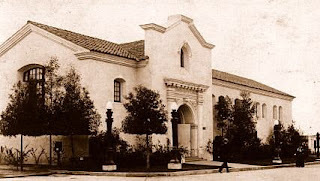 Located immediately west of the Spreckels Organ Pavilion, on the south side of the Panama-California Exposition's Via de los Estados, was the Alameda and Santa Clara Counties Building. Designed in a simple Spanish-Colonial style, the tile-roofed building featured a gabled and ornamented entrance portal, surmounted by a deeply-set arched window. The plain walls of the structure contained numerous pairs of flat-arched windows, with a heavy cornice located above. The interior housed fine displays of products from the California counties of Alameda and Santa Clara.